Outsourcing to a graphic design studio can reap huge rewards for your company. This is especially true if you are careful to choose the right firm. But first you have to decide! If you’re struggling with the decision, we’ve outlined ten advantages that contracting to a design firm will bring you. 1. You will save money. We all know how expensive employees are, especially in California. You can eliminate the burden of employment costs by hiring a graphic design studio that won’t require benefits like healthcare, unemployment insurance and retirement. 2. You will save time. Good design firms work fast. They are highly efficient businesses that leverage experiences on past projects to quickly arrive at solutions. >> Are you ready to choose a design studio but don't know where to start? Download here our 9 tips to help you choose your graphic design studio! 3. You will gain more creative talent. Instead of working with one employee in-house you will now essentially have an entire staff at your disposal. Most good graphic design firms have multiple people with unique talents and skillsets working on outsourced projects. The result is something that could never be achieved by a single person’s point of view. 4. You will get a fresh perspective. Sometimes when you are employed with a company you can’t see the forest for the trees. An outside perspective has the potential to show you what you may have been missing and need to bring to life. This is especially true if you are rebranding. 5. You will be on the cutting edge. Designs firms are immersed in the worlds of design and marketing. Part of their job is to keep up with the latest trends that are shaping the industry. You can rest assured the work will have a fresh and modern appeal. 6. Your interests will be aligned. Graphic design firms need every project to be a success if they want their firm to thrive. There is no “phoning it in” when you run your own business. They know if they can make you happy, you will refer their next client. 7. You can focus on other areas that drive your business. Once you outsource you know you have handed it off to the experts. You no longer have to worry about quality or performance reviews. It frees you up to be even more productive and helps your business grow. >> Now that you know some of the advantages of outsourcing, download our 9 tips to choose your graphic design studio here! 8. Graphic design firms crave accountability. You want a return on your investment and so does your outsourcing partner. That’s how they get more business, by showing ROI for your projects. Not every employee thrives on accountability. When you outsource, it’s all baked in. 10. They always put the cover sheet on their TPS Reports. No need for a memo to remind them to do the basics. Your outsourced graphic design agency knows that you’re the boss and you’re the one who needs to be pleased. Graphic design firms that are rewarded with outsourced work are great communicators who understand the needs of their clients. They save their clients time and money in a myriad of ways. If you want to get the results you’re capable of, then you should consider outsourcing to the experts. 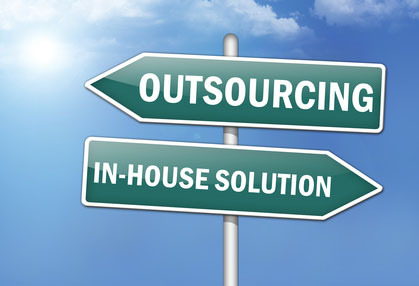 For more information on outsourcing, give us a call at (951) 479-5411.